What would you do if your country was invaded? 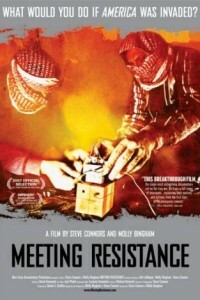 “Meeting Resistance” raises the veil of anonymity surrounding the Iraqi insurgency by meeting face to face with individuals who are passionately engaged in the struggle, and documenting for the very first time, the sentiments experienced and actions taken by a nation’s citizens when their homeland is occupied. Voices that have previously not been heard, male and female, speak candidly about their motivations, hopes and goals, revealing a kaleidoscope of human perspectives. Featuring reflective, yet fervent conversations with active insurgents, “Meeting Resistance” is the missing puzzle piece in understanding the Iraq war. Directed by Steve Connors and Molly Bingham, this daring, eye-opening film provides unique insight into the personal narratives of people involved in the resistance exploding myth after myth about the war in Iraq and the Iraqis who participate. Through its unprecedented access to these clandestine groups, “Meeting Resistance” focuses the spotlight on the “other side” leaving the viewer with clarity as to why the violence in Iraq continues to this day.